Welcome to the "did you know?" section of the website where you can improve your driving knowledge. Each week we will add some useful facts that you may not know or you may have forgotten. The new highway code was launched in September 07 and if you are a parent surfing for your childrens driving lessons you may not have seen this book for a very long time. Please scroll down the page to keep up to date. When driving in an area with street lighting,the speed limit will always be 30 mph,unless repeater signs tell you otherwise. Many drivers think that a dual carriageway is a road with two lanes. The number of lanes has nothing to do with a road being a dual carriageway,it may have three lanes or just one. The definition of a dual carriageway is a road that is seperated from oncoming traffic by a centre reservation ,ie a raised kerb on the right hand side of the road. How to pass your driving test first time! Why is the first time pass rate so low? The average 1st time pass rate at our local driving test centres is around 30%, which is ridiculously low. At Nigel Richards driving school we have an average 1st time pass rate of around 80%, this is because we work to a tried and tested system. We do not take pupils to test unless we feel they are going to pass (otherwise we waste your time and your money). We do not have a set amount of hours to complete as each individual will be different; however we do have a strict set of criteria to be covered. 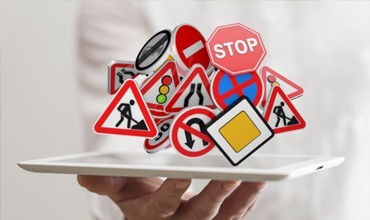 The Driving Standards Agency set out a syllabus to be covered and you need to be proficient in all the tasks listed if you are to pass your driving test. You need to be able to drive independently without the assistance of your driving instructor on a regular basis; if you are still making mistakes during your lessons then these mistakes are likely to escalate when under the pressure of a driving test. If however you are able to drive during your lessons with only a few errors then this should give you the confidence on test day, many blame nerves for failing, but in reality it’s usually more to do with the lack of confidence. Having the ability to drive opens up an entire new world of opportunities. Firstly, you are free to go where you want, when you want and don’t have to depend on intermittent public transport systems or the good graces of your parents, who forever guilt trip you about being a free taxi service. Seeing the world from four wheels can also be a great way to travel and the good old-fashioned road trip will never grow old and tired. Finally, you aren’t limited to working in your town; when the job is a 20-mile drive away, that’s not a problem. However, driving isn’t exactly cheap. First you have to pay to obtain lessons and to do the test, then you need to get a car, purchase fuel, services, MOTs, road tax and insurance and to tell the truth everything is getting more costly. So what else could you do to save as much money as you possibly can without scrimping of quality and enjoyment? Begin by making sure you have as few driving instructions you can. A lesson costs around £20 per hour in London so too many of them really will hurt your bank balance, so educate yourself as much as you possibly can to assist the task go as smoothly and quickly as possible. When buying a vehicle, think small, economical and green. Not only will an eco-friendly car give you more mileage for your pound it’ll also keep the road tax rate to a minimum. The cleaner the vehicle, the lower the tax. But additionally, drive sensibly. Harsh acceleration and breaking means more fuel so therefore greater expense as well as increasing the overall level of deterioration on the car. Insurance however will most likely be your biggest expense besides the actual purchase of the car, although in some instances, particularly for males under the age of 25, the insurance coverage can be more than the car. So be aware: don’t splash out on a large engine and high-spec car if you can’t afford the insurance. Figures state that one in five young drivers have an accident in their first year of driving, so insurance providers respond with high premiums. This makes deciding on the best insurance imperative. Search for companies with a good record for young drivers and lots of worthwhile extras contained in the policy. One such example is Kwik Fit Insurance, it offers a 20% discount for purchasing car insurance online and a totally free MOT. It is an offence to use fog lights, UNLESS VISIBILITY IS LESS THAN 100 METERS. Remember to switch them off as soon as visibility improves. Using them at any other time will severely dazzle following motorists. Key facts about learning to drive in Great Britain. The pass rate is 44%, so the average learner takes more than two tests before passing. 750,000 people qualify for a licence every year - three quarters of these are under the age of 25. Current average cost of a lesson is approximately £21.00 - up to £28.00 in London. The average learner has 52 hours of lessons and spends £1,500 learning to drive. A newly qualified male driver faces a insurance premium from £1,200 and a female driver of the same age faces a premium from £800.